From the moment you step into the front door of Heersema House you know you have found a delightful respite from the hustle and bustle of our fast paced world. 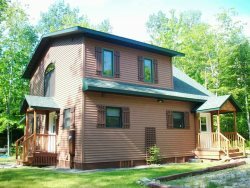 This charming home was masterfully designed by the current owners; and, features a wonderful wrap around screen porch and a cozy living room complete with fireplace. Plenty of reading materials are at your disposal so you can relax and enjoy the peace and quite of this wonderful home. Located on Big Bay Road at Sunset Bay you will find this a perfect location for a quick bike ride to Town Park or an easy ride to town. Enjoy Lake Superior across Big Bay Road overlooking Sunset Bay. The home also has a side deck with outdoor shower (recommended for a refreshing start of the day)! There are two bathrooms, the first floor bath features a claw foot tub; and, the second floor bathroom has a shower. Sleeping accommodations include three bedrooms on the second floor featuring a king bedroom, two twins in the second bedroom and the third with a trundle bed. There are also two twin beds on the first floor. Everyone was very helpful and kind. Great customer service! My family and I love this place and we will keep coming back. I always feel so relaxed when I'm there. The management team at Madeline Island vacations was efficient and enthusiastic. Our stay at Heersema House was beyond our expectations. Our only regret was we couldn't' stay longer! The team was awesome. Everyone was very helpful. I want you to know this place just relaxed me. I have not had that level of relaxation in a long time. we have already made the decision to be back next year. I have found my little piece of heaven. Taking my coffee on the porch before sunrise and watching it was a highlight no one should miss. Easy to work with the team!!! We loved staying at Heersema House! It's a fabulous property with an amazing porch and views of the sunset. The dock is very private and large enough to put multiple chairs out on it.